Fragile X-associated tremor/ataxia syndrome (FXTAS) is a neurodegenerative condition. The term neurodegenerative means that the syndrome affects the nervous system and that it gets worse with time. FXTAS is related to fragile X syndrome in that both conditions are caused by abnormalities in the same gene, FMR1 (see below for details). However, FXTAS is a disease of adulthood, while fragile X syndrome is typically first observed in the very young. FXTAS was first described in 2001, making it a new condition in the medical literature. This fact makes diagnosis difficult, as many neurologists are not familiar with it. FXTAS also resembles other relatively common conditions, such as Parkinson's disease, which also complicates diagnosis. FXTAS may be underdiagnosed in the population and may therefore be more common than is thought at this time. FXTAS affects 1 out of every 3,000 men over age 50 (1). Prevalence statistics for women are not known. Tremor is usually the first sign of FXTAS (2). Other early problems that may develop include erectile dysfunction, neuropathy, and dysfunction of the autonomic nervous system, such as low blood pressure (reviewed in 3). The tremor may persist for many years before other problems such as gait ataxia develop. Decline may become more rapid after gait ataxia develops (3). Note that gait ataxia may also be an early sign (2). FXTAS patients often develop parkinsonism, which is a set of problems (slow movements, stiffness/rigidity, postural instability, and tremors). Note that this term refers to a set symptoms and not to Parkinson's disease (PD): many people with parkinsonism do not have Parkinson's disease (PD). In fact, according to the International Parkinson and Movement Disorder Society, roughly 80% of people with parksinsonism have PD, and the rest have other disorders (4). The similarities between PD and FXTAS can make accurate diagnosis difficult. The average age of symptom onset in FXTAS is 60.2 years (reviewed in 5). The first video in the links on the right shows a man FXTAS who has these problems. Tremor is often of the intention type, meaning that it appears when a person is trying to perform a precise movement, such as reaching for something. Ataxia typically manifests as gait ataxia, which is an unsteady gait (staggering, often wide-based). People with gait ataxia often have trouble with heel-to-toe walking. In this test, the heel of one foot is placed so that it is just in front of the toes on the other foot. A step is taken by moving the back foot so that its heel is close to the toes of the other one. A person taking this test may fall and another person should be present to help avoid falls. Other common clinical features of FXS are listed below. Child or grandchild with fragile X syndrome. A very important clinical feature of FXTAS is the MCP sign. 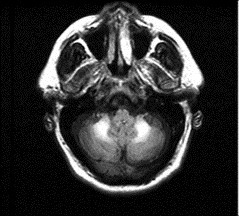 This sign is an abnormality that can be seen on an MRI In the photo at top right, the MCP sign is visible in the lower half of the picture as two bright white spots in an area of the brain called the middle cerebellar peduncles (MCPs). An MCP sign indicates that a person has lesions of the white matter in this part of the brain. One study found that ~59% of 46 patients with FXTAS have this sign (6). In our analysis of published cases, we found that 67% of 123 patients had it. Although the MCP sign is not unique to FXTAS, it is a major criterion in diagnosing FXTAS. People with FXTAS have a masked facial appearance that may cause them to look uncaring or unaffected by something that would normally trigger a smile, a frown, or another facial reaction. It is important to remember that these patients cannot control their facial expressions. Like fragile X syndrome, FXTAS is caused by abnormalities of the gene FMR-1 (7). FMR-1 is located on the X chromosome, meaning that conditions associated with it are X-linked. Females have two X chromosomes, and males have only one. This is why mutations and other abnormalities on the X chromosome tend to affect males more seriously than females --- if a female inherits a faulty copy of the chromosome, she will likely have a normal copy that can compensate for the faulty one. A mutated gene on an X chromosome can be passed from fathers to daughters or from mothers to sons or daughters. Fathers pass Y chromosomes to their sons and therefore cannot transmit a damaged X chromosome to a boy. The mutation that occurs in FMR-1 is called a trinucleotide repeat expansion. This term means that a sequence of 3 DNA base pairs (a trinucleotide) is repeated over and over again. In FXS and FXTAS, the sequence is CGG. In general with disorders in the trinucleotide repeat group, the more times the sequence is repeated, the more severe the disease. In the healthy population, the CGG sequence is repeated 5-50 times, with an average of 30 (8). Some sources note that 5 - 44 repeats are normal, with 45-54 being in an intermediate or grey zone (9). People with 55-200 CGG repeats have what is called a premutation. FXTAS is caused by premutations. Many people in this group have no clinical features of fragile X syndrome, although some may have mild to very mild clinical features (reviewed in 10). Physical features may include prominent ears and lax joints. The question of the effects of a premutation on behavior and cognitive ability in the absence of FXTAS have not been completely answered. However, some studies have found that patients may have mild emotional impairments, mild deficiencies with memory and attention span, and problems with executive function. People with premutations may also have higher rates of hostility, anxiety, and obsessive-compulsive symptoms compared to people without the premutation (all information reviewed in 9). Premutations can be passed to offspring. Some become unstable and may expand in future generations (11). Roughly 20% of females with premutations have primary ovarian insufficiency, and 30% of males over age 50 develop a disorder called FXTAS (reviewed in 12). Finally, people with >200 repeats are said to have full mutations, which result in fragile X syndrome. Although FXTAS and fragile X syndrome are both caused by abnormalties in the same part of the same gene, they are very different disorders. A primary difference between them is that FXTAS generally begins to appear in adults, whereas the signs of fragile X syndrome are visible in infants and very young children. The table below summarizes the most important similarities and differences between the two conditions. In the early stages of FXTAS, patients may only have one symptom (usually tremor). Unfortunately, this symptom is non-specific and occurs in a variety of conditions. As time passes, other problems develop, including gait ataxia and parkinsonism. Patients may also lose sensation, have numbness or tingling, and develop weakness in the lower limbs. Some develop incontinence and/or erectile dysfunction. These problems are also seen in Parkinson's disease and other conditions, making diagnosis difficult. As a way of addressing this difficulty, formal diagnostic criteria were developed (13). They are reproduced in the table below. Diagnosis is definite if one major radiology sign and one major clinical symptom are present. Diagnosis is probable if one major radiology sign and one minor clinical symptom are present OR if two major clinical signs are present. Diagnosis is possible if one minor radiology sign and one major clinical symptom are present. Diagnostic testing for FXTAS is performed using polymerase chain reaction (PCR) to determine repeat size. This method is very sensitive and is offered by many commercial and academic laboratories. The link at the right provides a list of facilities that can perform testing. Parkinson's disease (PD). PD is a progressive disorder that affects movement. Like FXTAS, it tends to appear in older people, with an average age of onset of roughly 60 years. The clinical features of PD are very similar to those of FXTAS: its primary features are tremors, slow movements, stiffness, and postural instability. Patients may also experience depression, problems with eating and speech, sleep difficulties, and other problems. Given that these four problems are very common in FXTAS and given that PD is a relatively common condition, it is not surprising that FXTAS patients may initially be diagnosed with PD. One possible way to distinguish them is that people with FXTAS are more likely to have relatives with fragile X syndrome. Additionally, the presence of an MCP sign on MRI is evidence in favor of FXTAS over PD (though the MCP sign is apparently less common in women with FXTAS; 14) Finally, FXTAS patients harbor premutations in FMR1, while PD patients do not. Tremor. Tremor is an involuntary oscillating movement of a body part. Some people might describe it as shakiness. There are different types of tremors that are often divided into two groups: resting and action (15). A resting tremor occurs in a body part that is completely relaxed, such as when a person's hands are sitting on his lap or resting on the arm of a chair. These tremors often affect the hands or fingers. A resting tremor decreases when a person moves, such as by reaching for something. Alternatively, it can be aggravated by mental stress (such as counting backwards) or during a distracting activity (such as walking). Resting tremors are often associated with Parkinson's disease. Action tremors occur during voluntary movement, such as reaching for an object or trying to button a shirt. There are many subtypes of action tremor. For example, postural action tremors occur when holding a part of the body against gravity (e.g. holding the arms outstretched). Kinetic action tremors affect voluntary movement, such as using utensils or fastening buttons. Intention tremors are a subtype of kinetic tremors; shakiness gets worse when the target is reached (may occur, for exmaple, during a finger-to-nose-to-object test). Some tremors can be specific to a task (such as writing), and some may occur when tightening a muscle without moving it (isometric tremors). This list is not comprehensive. Action tremors often result from problems in the cerebellum, a part of the brain that controls movement. Alcoholism can also cause them. The man in the video linked to at right has a variety of tremors. There are no strict criteria for distinguishing different subtypes of tremors, and there is overlap between them. In addition, different types of tremors may occur together. For example, a PD patient may have a resting tremor and an action tremor. These facts make accurate diagnosis difficult. Tremors are only one part of FXTAS. Alzheimer's disease (AD). AD is a common form of dementia, affecting 1 person in 9 over age 65 (more than 5 million Americans). People with AD have trouble with retaining memories of recent events, such as conversations or occurences. They may forget to turn a burner off or forget a neighbor's name. They may also become easily disoriented, even in familiar places, or be unable to follow directions. Other signs of AD include speech difficulties, personality and behavior changes, hallucinations, and agitation. Some of these abnormalties, such as executive dysfunction and dementia, are also associated with FXTAS, especially in its later stages (16). Other conditions are similar to FXTAS are described in reference 17. Females with premutations may develop a condition called fragile X-associated primary ovarian insufficiency (FXPOI; 18). Women with this problem have ovaries with reduced function. Some of the common problems associated with FXPOI include irregular periods, infertility, and early menopause (including hot flashes, insomnia, and osteoporosis/thinning of the bones). In some women with FXPOI, periods may stop and then start again after time has passed. Roughly 20% of women with premutations develop FXPOI (reviewed in 19). Women with premutations are also at increased risk for a variety of problems, including the following: high blood pressure, migraines, neuropathy, dizziness or other problems that may affect balance/equilibrium, depression, ADHD, sleep disorders, and other problems. This list is not comprehensive. For more information, see reference 9, an excellent review on the subject. 1. Jacquemont S et al. (2004) Penetrance of the fragile-X associated tremor/ataxia syndrome in a premutation carrier population. JAMA 291(4):460-469. Full text available from publisher. 2. Leehey MA et al. (2007) Progression of tremor and ataxia in male carriers of the FMR1 premutation. Mov Disord 22(2):203-206. Abstract on Pubmed. 3. Hagerman R & Hagerman P (2013) Advances in clinical and molecular understanding of the FMR1 premutation and fragile X-associated tremor/ataxia syndrome. Lancet Neurol 12(8):786-798. Full text on PubMed. 4. International Parkinson and Movement Disorder Society. Fact retrieved from website on 1 October, 2016. Source of information Home page. 5. Berry-Kravis E et al. (2007) Fragile X-associated tremor/ataxia syndrome: clinical features, genetics, and testing guidelines. Mov Disord 22(14):2018-2030. Full text available from publisher. 6. Jacquemont S et al. (2004) Aging in individuals with the FMR1 mutation. Am J Ment Retard 109(2):154-164. Full text on PubMed. 7. Hagerman RJ et al. 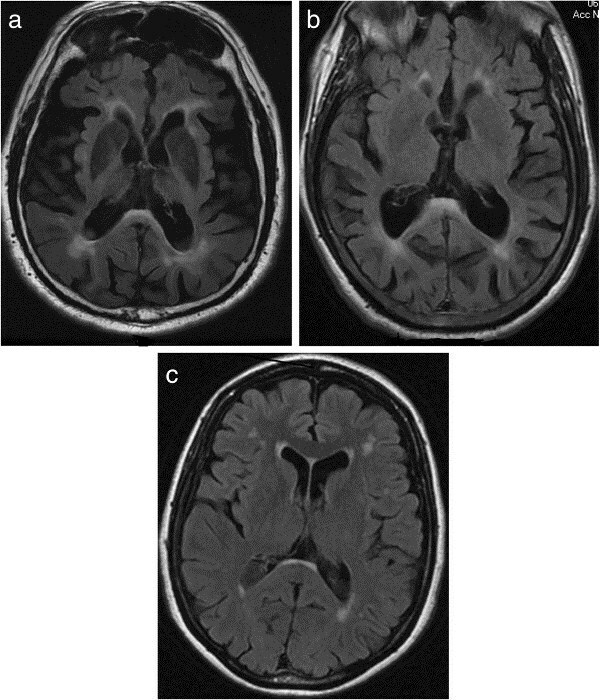 Intention tremor, parkinsonism, and generalized brain atrophy in male carriers of fragile X. Neurology 57(1):127-130. Abstract on Pubmed. 9. Wheeler AC et al. (2014) Associated features in females with an FMR1 premutation. J Neurodev Disord 6(1):30. doi: 10.1186/1866-1955-6-30. Full text on PubMed. 10. Van Esch H (2006) The Fragile X premutation: new insights and clinical consequences. Eur J Med Genet 49(1):1-8. Abstract on Pubmed. 11. Fu YH et al. (1991) Variation of the CGG repeat at the fragile X site results in genetic instability: resolution of the Sherman paradox. Cell 67(6):1047-1058. Abstract on Pubmed. 12. Hagerman P (2013) Fragile X-associated tremor/ataxia syndrome (FXTAS): pathology and mechanisms. Acta Neuropathol 126(1):1-19. Full text on PubMed. 13. Jacquemont S et al. (2003) Fragile X premutation tremor/ataxia syndrome: molecular, clinical, and neuroimaging correlates. Am J Hum Genet 72(4):869-878. Full text on Pubmed. 14. Hall DA et al. (2014) Emerging topics in FXTAS. J Neurodev Disord 6(1):31. doi: 10.1186/1866-1955-6-31. Full text on PubMed. 15. 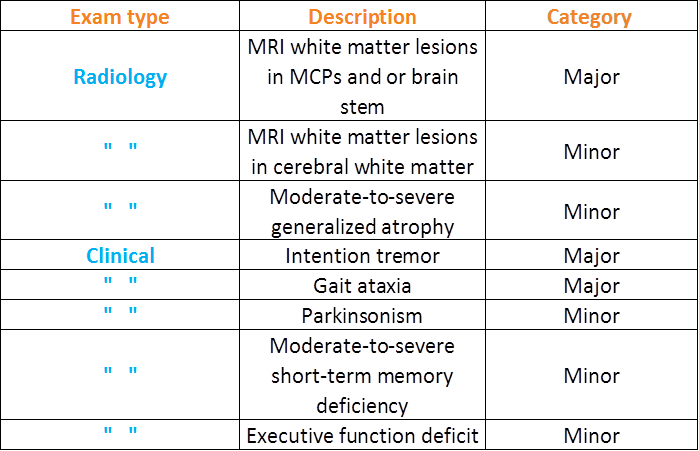 Crawford P & immerman EE (2011) Differentiation and diagnosis of tremor. Am Fam Physician 83(6):697-702. Full text available from publisher. 16. Seritan AL et al. (2008) Dementia in fragile X-associated tremor/ataxia syndrome (FXTAS): comparison with Alzheimer's disease. Am J Med Genet B Neuropsychiatr Genet 147B(7):1138-1144. Full text on Pubmed. 17. Hall DA et al. (2005) Initial diagnoses given to persons with the fragile X associated tremor/ataxia syndrome (FXTAS). Neurology 65(2):299-301. Abstract on PubMed. 18. Sullivan AK et al. (2005) Association of FMR1 repeat size with ovarian dysfunction. Hum Reprod 20(2):402-412. Full text available from publisher. 19. Lozano R et al. (2014) Fragile X spectrum disorders. Intractable Rare Dis Res 3(4):134-146. Full text on Pubmed. 20. Hall DA & O'Keefe JA (2012) Fragile x-associated tremor ataxia syndrome: the expanding clinical picture, pathophysiology, epidemiology, and update on treatment. Tremor Other Hyperkinet Mov (NY) 2012;2:tre-02-56-352-1. doi: 10.7916/D8HD7TDS. Full text on PubMed. 21. Nitrini R et al. (2010) Dementia in fragile X-associated tremor/ataxia syndrome. Dement Neuropsych 4(1):79-83. Full text from Scielo. 22. Image from the Ransom Notes wiki. Above: Tremor in FXTAS affects a person's ability to draw a spiral. 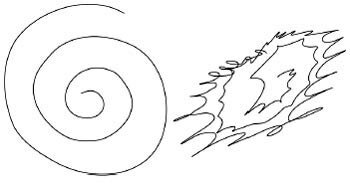 Left side: spiral drawn by healthy person; right side: spiral drawn by FXTAS patient. Source: Reference 21. 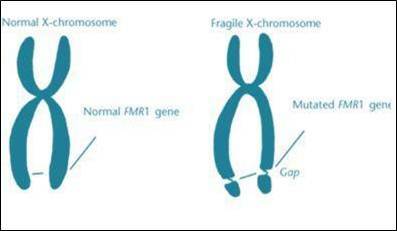 Below: A fragile X chromosome (right) compared to a normal X chromosome. Source: Ransom Notes wiki (reference 22). Corpus callosum abnormalities in fragile X-associated tremor/ataxia syndrome (FXTAS). may be helpful in diagnosing those without the MCP sign.